“Lord have mercy, Jesus,” is the prayer I prayed just before I hit the record button on my phone. I’m preparing to record my first YouTube video. I’ve made all the preparation needed for the video to be a success. I have my note laid out; I’ve practiced my introduction about 10,000 times; I’ve outlined the flow of the video. I am ready to do this. I’m trusting the Holy Spirit will step in and speak because, to be honest, I am nervous as you know what. I sit in front of the camera, spit out my practiced introduction. “Cut,” yelled the director in my head. “That was too fast,” it scolds me. I repeat my intro, this time slower. And this is how it went for 60 or more takes and I’m not even exaggerating. I’d repeated the same sentence so many time for more than 3 hours that by the end of the day I was hoarse and physically exhausted. Why, you ask, did I put myself through retake after retake? On the surface, I would say the perfectionist in me wanted the line to be perfect, but if I’m honest with myself and you all I yelled cut over and over again out of fear. Fear that the line could be said better. Fear that I wasn’t saying the line right. Fear is a force behind a lot of things we do or don’t do. 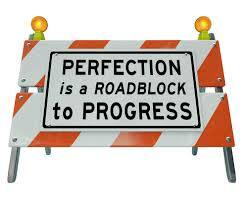 Perfectionism is fear packaged in a pretty box that we like to think of as productivity. The perfectionist will feel like she’s being productive when in fact, all she’s doing is spinning her wheels and getting nowhere fast. Your internal dialogue will keep telling you that it could be better; to try it again until you get it right. But the thing your internal dialogue doesn’t reveal is that because of the fear of not getting it right it will never be right in your eyes. No matter how many times you do it. As I look back over those 3 hours, 60 takes, I realize many of the videos weren’t as bad as my fear made them out to be. They weren’t perfect, but God didn’t ask for perfection he asked for obedience and faith that he’ll do the rest. The next day, I was completely worn out. I mean I felt like I ran ten miles. As I assessed my wariness, I realized I had to repent; pride had me thinking it was going to be easy, that I was going to get in front of the camera and the words were going to flow from me. I thought I was going to birth this project without and labor pains. But God said nope if you want this you are going to work for it. Let go of the fear of not being perfect because guess what you aren’t and work at your ministry. So that’s what I’m working on; I’m letting go of the perception of perfection and doing the work of the Lord. I’m trusting God to take my imperfections and use them for His perfect will. Is the fear of not being perfect keeping you from doing God’s work? Have you overcome perfectionism? I would love to hear from you. Previous story Saved, Now What?